A special Thank you to Delacorte and NetGalley for sending this book to review. 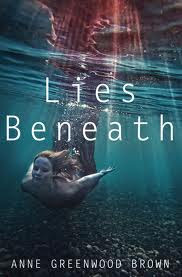 I like Lies Beneath but,I mostly like it because I love the scary mermaid sisters. The storyline is awesome and I love how it's written. It's just that my mind is a bit juvenile for this and I must admit that I skipped a few romantic paragraphs. My sister grace can read them seriously but ,I get all embarrassed and blush when its from the boys point of view. Girls point of view no problem boys view ,boom I am hiding my head beneath a pillow from embarrassment .I know its silly but I can’t help it. So I hope you all enjoy it because it is awesome so read it. Excellent review Morgan and I completely understand about the boy's point of view. I liked the scary mermaid sisters too. I really liked Lily -she wasn't afraid to be herself. Thanks for sharing your review! I love mermaids and everything ocean related so i am definitely getting this one!the mermaid sisters sounds extremely creepy, lol:D Thanks for your review Morgan, you made me want it even more!